My eating habits haven’t exactly been super healthy lately. It’s not that I’ve been eating junk food, but I’ve been eating out a lot, having quite a few drinks, and there was this, and this, and that. So I’m trying to come up with tasty but healthy homemade meals. tonight’s was definitely tasty, and I believe it would qualify as healthy. 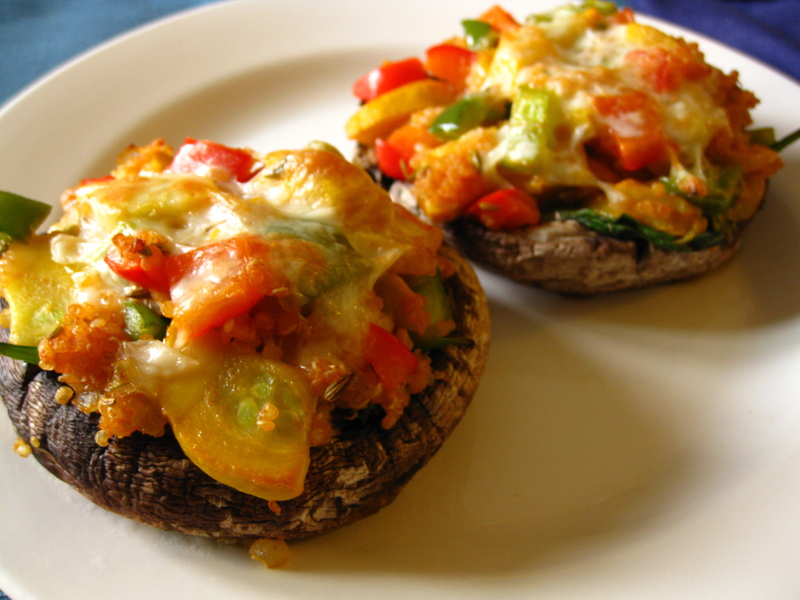 Portobello mushrooms stuffed with quinoa, zucchini, peppers and spinach. I usually stuff Portobello’s with italian sausage, so to get that flavour without the fatty sausage, I fried the zucchini in onion and garlic with some fennel seeds and hot pepper flakes. The mushrooms can’t hold enough liquid to cook the quinoa, so I cooked it while frying the zucchini. Then I combined all the ingredients and a bit of pureed tomato, filled the mushrooms, topped them with a bit of mozzarella and baked them at 450 for 10 minutes. I want the black forest cake but the stuffed Portobello mushrooms look good too and are healthier, everything looks good here! I like the quinoa in the stuffing, really yummy! This sounds wonderful. Portobello’s are so wonderful for stuffing. These look so good! I love the healthy stuffing, and sort of wonder how they would be grilled. I’m trying to limit using our oven as much as I can during the summer heat! I don’t have a bbq (crazy, I know), but I’m sure they could be grilled.